On Sundays we generally do a post to set the tone for the coming week. Today’s post, on the surface, might appear to be about an Olympic athlete. But if you look deeper, it’s a lesson for every person. Each of us has goals, dreams and ideals that we seek. For many of us, we struggle for years before we get that breakthrough that we’ve yearned for. We make sacrifices. We work morning, noon and night to reach the goals that we aim for. My poem, The Olympian, was published in 2006 in my book Poems of Inspriation: A Daily Dose of Self-Motivation . 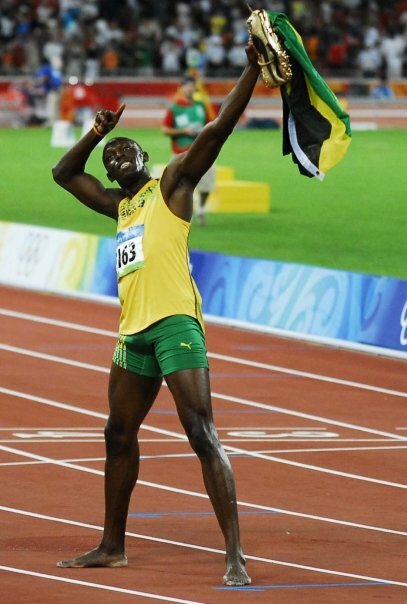 Interestingly, two years later, at the 2008 summer Olympic games in Beijing, Usain Bolt of Jamaica became the literal manifestation of the poem. Prior to then, relatively few people had heard his name. 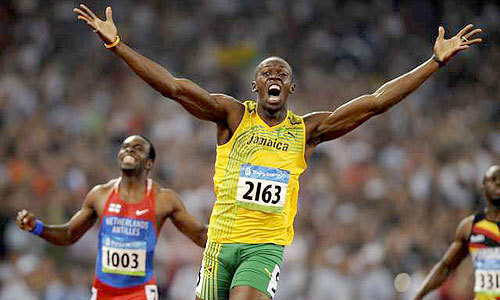 Earlier that year, many persons heard his name for the first time as he set the new world record in the 100 meter dash. Still, that occurred at a relatively unknown event that few outside of the sports world even watched. But Bolt “bolted” to the headlines of the summer games in Beijing, setting world records in the 100 meter and 200 meter dash in the process. Someone who grew up in relative obscurity in a small country, almost overnight, became a household name on the biggest stage possible as an athlete. His lifetime quest was reached in a matter of seconds. That’s powerful, isn’t it? How does this relate to us? The goals that we pursue might be career oriented; or perhaps family or even personal. Whatever the case, we have the ideals that we aim for. And every so often, an opportunity to shine becomes available to us. We have the chance to seize the moment, and in so doing, we can live the life of our dreams. As we get started on this new week, let the story of the Olympian inspire you. Picture yourself in the starting blocks as you prepare to run the race of your life. Great possibilities lie ahead for you and your family as you seize the opportunities that life presents to you. the pleasures of life all for this moment. in the lanes next to me all I see is that finish line. I must be the first to reach it. Let’s go out and make it a great week – one that we’ll never forget. And like the Olympian, our lives will never be the same!